2011 Aug 19 OWOC Gulf Flight - Why hasn't all the oil gone? UPDATED 2011 Aug 25 -- gps coordinates and times for all photo subjects, plus one more video, and the entire Flight Track with position coordinates and times is now available at the main menu "Flight Tracks"! We've included a few photos in the descriptions of each significant sighting below; see the galleries below the article for many more photos and videos taken today by our friends from Gulf Restoration Network (GRN; Jonathan Henderson and Tarik Zawia). The GRN blog and link to photos can be found here. As we headed toward Breton Island, just about at the point where the Mississippi River Gulf Outlet ("MR-GO") meets the Gulf (waypoint "9113" in the BaseCamp file -- lat/longs N29°44.350', W089°28.887' W), we began to see vast sheets of those dark reddish brown subsurface plumes and streamers again. They extended to and beyond Breton Island (roughly lat/long 29°30'N, -088°10'W), and they reached right up to the coastlines. We would love to hear from experts out there who could improve on our naive speculations about whether this was algae, part of a dead zone, a mix of Mississippi river sediment, or whether it could be related to subsurface oil leaks. We saw little or no sheen with it, nor did the coastal vegetation look burned. All photos of this brown-red stuff were taken between 1031 and 1103 CDT. Next we headed toward the Taylor Energy (Ocean Saratoga) site (roughly 29°'N, -089°W, waypoint 9110). Not far from there we saw four buoys and a large vessel with platform for a submersible, and trailing for about a half-mile behind that vessel but not obviously coming from it was a line of strange-looking oily spherical globules. Later we would see much more of this strange-looking oily stuff near the DH site. We also saw some very strange expanses of greenish linear plumes, each maybe 300 feet wide and separated from the next one by about that same distance, running south to north (roughly). Maybe someone out there can tell us what these were? The gps mark for these was #9115: N28°42.962', W088°30.952', and the photos were taken between 1202 adn 1205 CDT. After these disappeared, we did see one large pod of bottlenose dolphins. We also came across an unusual 'string' of buoys, apparently anchored; some sort of sounding measurements? The gps point for these was #9116: N28°44.752', W088°25.793, and the photos were taken at 1209 CDT. As we reached the DH site, we began to see numerous collections and lines of those strange-looking globules in what was otherwise smooth blue water. More photos and videos of these things are included in the galleries at the end of this article. There were many more trails of globules than marked with gps waypoints, but the two waypoints we marked were #9117, at N28°44.1188', W088°23.016', and #9118: N28°43.743', W088°08.923. The photos of these globules were all taken between 1213 and 1221 CDT. We decided to explore farther east, in part because there were more platforms in that directions with smaller vessels (presumably supply boats) around them. We wanted to see if those "40 shrimp boats" rumored to have been out there earlier this week might still be there! We saw no shrimp boats, but we did begin to see bait balls jumping with tuna. I told my passengers that last year around this time, we used to find whale sharks at the center of those bait balls…. so of course we had to check some of them out. BINGO! 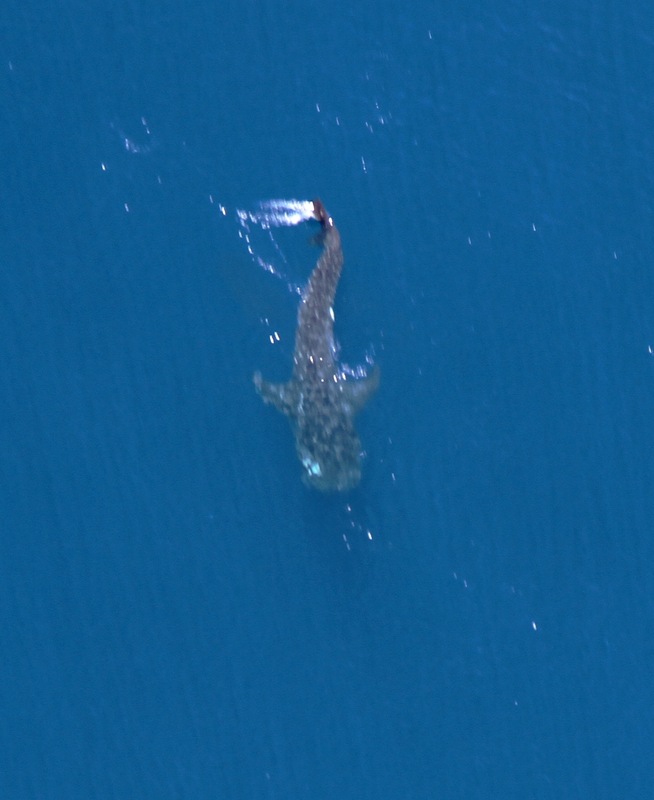 Within ten minutes we had found four whale sharks, one in each active bait ball we explored! These sightings correspond to waypoints #9119 -- N28°44.107', W088°09.387' (two whale sharks in close proximity -- but still in distinct bait balls) and #9120 -- N28°49.266', W088°16.129'. 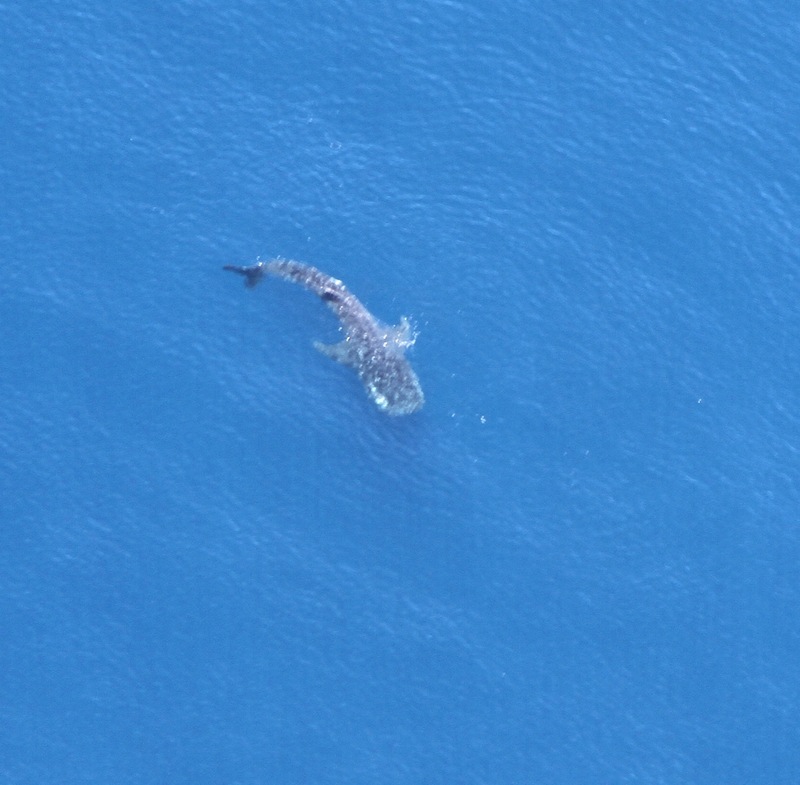 The whale-shark photos were all taken between 1227 and 1247 CDT. 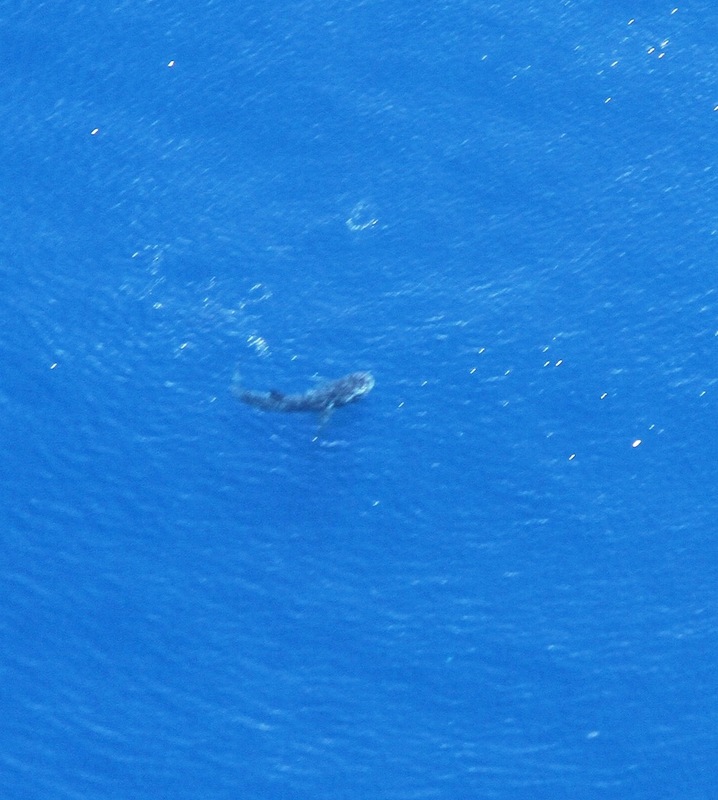 Continuing northwestward, roughly back toward New Orleans, we spied a lone sperm whale (waypoint #9121 -- N28°53.413', W088°22.506'), and nearby a leatherback turtle! 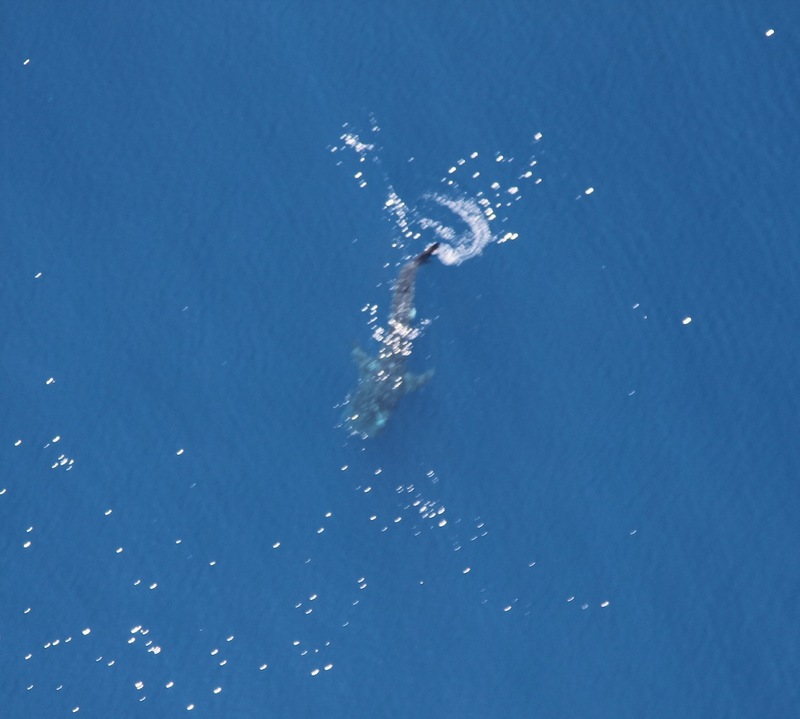 The lone sperm whale photos were all taken between 1255 and 1301 CDT. Soon after we came across a pair of sperm whales -- looked like a mom and teenager (waypoint #9122 -- N28°53.918', W088°22.672')! These photos were taken betwen 1302 and 1304 CDT. Oh this was getting to be really fun (way more fun that seeing oil where there should be blue water). Farther north, as blue water faded to green, we began to see dense arrays of oil platforms. And soon after that we saw a barge pulling large pipes (for dredging? or perhaps oil pipeline?) and another towboat nearby pulling what looked to be the top of an offshore drilling platform (#9123 -- N29°07.729', W088°38.327'). These photos were taken between 1321 and 1325 CDT. Then came the oil sheen… ugh (#9124 -- N29°13.147', W088°38.469'); photos taken between 1328 and 1332 CDT. This sheen extended at least a mile north-to-south -- but there were no rigs or platforms nearby. Was this a leaking pipeline? These photos were taken between 1328 and 1332 CDT. And then, within a mile to the north and northeast, there were one, two, ….. EIGHT shrimp boats in the near vicinity, all with their nets down! We wondered if they knew that all this oil was floating so close to them. We continued homeward toward New Orleans, observed another surface sheen, about 2 miles long (northeast to southwest; waypoint #9125 -- N29°32.556', W089°07.828'). Nearby there was a platform with a jack-up barge next to it. And just to the northeast of that (waypoint #9126 -- N29°34.394', W089°07.045') we saw some very serious surface rainbow sheen, at least two miles long and joining the previous one. The platform was labeled "BSBLK21". Not only was the facility leaking badly, they must have known they were having some problem with gases, because a short distance away they were burning their flare. We later reported this and the two other leaking sites to the NRC. These photos of the second slick were taken between 1355 and 1402 CDT. We also saw many schools of redfish scattered to the southwest of this area, and a large school of cownose rays northwest of here, sitting along a very distinct convergence line. To summarize: We found significant amounts of oil in globule form still at the Deepwater Horizon (DH) site and at the Taylor Energy site, and we saw miles-long surface rainbow sheens from two different leaking platforms between DH and the Chandeleur Islands. Eight shrimp boats with their nets in the water were within one mile of these two leaking platforms. In the 'blue waters' out toward the DH site we were puzzled by some long, wide, unnatural-looking dark-green colored stripes. Finally, dark brownish-red subsurface plumes like what we had previously documented around Breton Island (Mar 2011) spanned miles in width and length, right up to the coastlines, beginning where the Mississippi River Gulf Outlet ("MR-GO") meets the Gulf south to Breton Sound. With all of that, we were ecstatic also to see three sperm whales, one leatherback turtle, four whale sharks, tuna, redfish, bottlenose dolphin, and cownose rays. 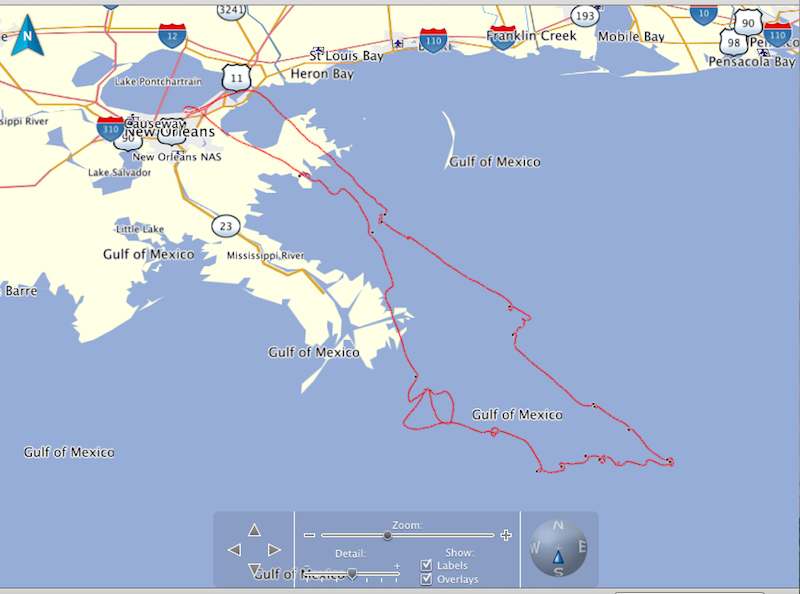 We intend also to fly over a large semi-submersible oil platform located about 150 miles southeast of New Orleans. The "Thunder Horse PDQ" (Production Drilling facility with crew Quarters) is a joint venture between BP and ExxonMobil -- the largest offshore installation of its kind in the world. BP has admitted that "a silvery oil sheen measuring 2 feet by 30 feet has been reported on the surface" there, and they have supposedly sent vessels to check it out. Stay tuned for our check on it soon! Here are some videos of the two oil slicks we found on the way back from the DH site, and a few of the sperm whales. Following these are galleries of more of our favorite photos from those Jonathan Henderson of GRN took yesterday. If you want high-resolution (~8MB) versions of any of these, contact us and tell us the filenames and we'll oblige asap.